The Queen's Diamond Jubilee this year - only the second such Jubilee in Britain's long history - will be a truly historic milestone in the life of the nation. To celebrate this grand royal occasion, the Royal Mint has struck a beautiful new £5 coin with two new portraits of The Queen spanning her long reign. 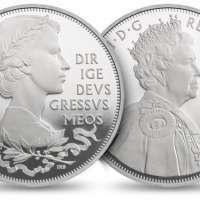 It is the first coin ever struck to commemorate a Diamond Jubilee - there were no special coins for Queen Victoria's Diamond Jubilee in 1897 - and is certainly worthy of the occasion. 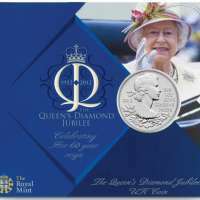 It is minted to Brilliant Uncirculated standard - a higher quality than the coins in your pocket - and is set within a beautifully illustrated display folder. 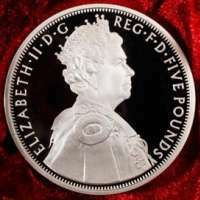 The Diamond Jubilee £5 coin is a fabulous souvenir of this once-in-a-lifetime occasion and is ideal for street parties and Jubilee celebrations. The Design The coin designs have been largely inspired by the commemorative medal struck for Queen Victoria's Diamond Jubilee which married the Old Head coinage portrait with the Young Head. 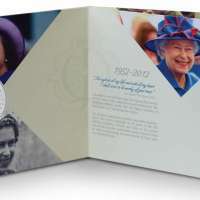 Both have been created by Ian Rank-Broadley FRBS, exclusively for the Diamond Jubilee. The obverse, reminiscent of his own sculpture created for the Supreme Court building in Parliament Square, features a faithful portrait of The Queen as she is today, crowned and wearing the robes of the Order of the Garter. 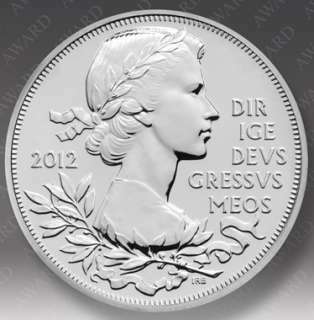 The reverse bears a portrait of the young Queen Elizabeth just as she appeared on her first coinage with decorative leaves reminiscent of Queen Victoria's Diamond Jubilee medal. In another link to the coinage of Victoria, the latin words DIRIGE DEUS GRESSUS MEOS (May God Guide My Steps) which appeared on the gold £5 coin of 1839, completes the design.